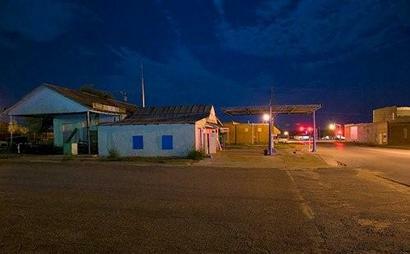 Rotan began as White Flat, a town that predated the organization of Fisher County (1886). The town managed to hold on until 1906, when the Texas Central Railroad decided to make the town their western terminus. The railroad arrived the following year and when they applied for a post office, they found the name had already been taken. Enter Ed Rotan, major stockholder in the railroad. The town was soon renamed in Ed�s honor, and under the new name the town grew in importance � not just in Fisher County, but for neighboring Stonewall and Kent counties as well. The population was 500 by 1914 and in 1923 the Rotan Gypsum Plant was built for the mining and processing of the abundant gypsum. 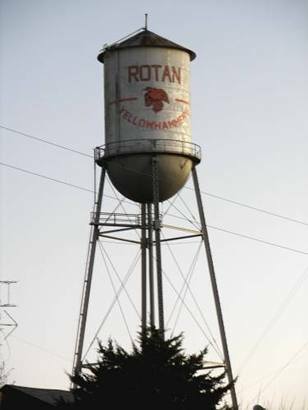 Just as the Great Depression was unleashing its fury of unemployment and foreclosures, Rotan had over 1,600 residents and 100 businesses. The gypsum plant was sold to the National Gypsum Company in 1935 and eventually became one of the largest of its kind. The 1940 population grew to 2,029 and ten years later it reached its zenith at 3,159. As the rural population of Texas moved to the cities, the population entered into a period of steady decline. The 1960, 1970 and 1980 population figures were 2,788, 2,404, and 2,284 (respectively). In 1990 the population stood at 1,913, which has since declined to the present 1,495 (2010).